The Egyptian parliament’s legislative and constitutional affairs committee will begin holding national dialogue meetings on proposed amendments to the country’s 2014 constitution on Wednesday. Sources said the dialogue was scheduled to begin on Monday and Tuesday, but it was postponed to Wednesday and Thursday as parliament speaker Ali Abdel-Aal and a number of leading MPs were attending the Arab-African Youth Forum in Aswan this week. On Wednesday, heads of a number of Egyptian universities and members of its teaching boards, as well as representatives of student unions, are expected to join the national dialogue’s first hearing session. As many as 60 participants are invited. In addition, as many as 30 clerics from Al-Azhar institution and the Coptic Church, as well as 30 participants representing the National Media Organisation, national press organisations (heads of boards and editors-in-chief), and radio and television channels (prominent hosts and anchors from private and public channels). “In total, 120 participants are expected to attend the first national dialogue meeting on the proposed constitutional amendments on Wednesday,” said an informed source. On Thursday, representatives of cabinet ministries and provincial governorates (80 participants) are invited to join the second meeting. Besides, delegations from the National Council for Women, the National Council for Childhood and Motherhood, the National Council for the Physically Challenged, the National Council for Human Rights, the National Bank of Egypt, the Public Authority for Financial Control, the Central Auditing Agency, and the Administrative Control Authority are also expected to attend (40 participants). The national dialogue meetings on the proposed constitutional amendments will continue next week, including Saturday (23 March), Sunday (24 March), Monday (25 March), and Thursday (28 March). “In total, there will be six hearing sessions over a span of two weeks,” said Ahmed Helmi El-Sherif, the deputy head of the legislative and constitutional affairs committee. On Saturday, the minister of justice and representatives of judicial authorities, the Armed Forces and the higher council for the police (120 participants) are invited to join the third session. On Sunday, representatives of professional syndicates, private sector companies, leading banking officials, and the Federation of Egyptian Industries and Chambers of Commerce (120 participants) are also scheduled to attend. The fifth and sixth hearing sessions will be the most important. These will see 120 officials representing most political parties coming to the Monday meeting (25 March). In a concluding meeting on 28 March, a long list of public figures, constitutional law professors, and representatives of NGOs and civil society organisations (120 participants) are expected to attend. The list of public figures includes Fathi Sorour, the former long-standing speaker of the Mubarak-era’s parliaments; Mostafa El-Feki, head of the Bibliotheca Alexandrina; Magdi El-Agati, the former minister of parliamentary affairs; Fathi El-Masry, head of the Court of Cassation; Mohamed Abdel-Wahab El-Eissawi, deputy head of the State Cases Authority; Abdel-Raouf Moussa; head of the Administrative Control Authority; Gaber El-Maraghi, head of Cairo’s Appeals Court; Hassan Farid, head of the High State Security Court; Mohamed Yasser Aboul-Fotouh, head of the Committee in charge of freezing and sequestrating the funds of terrorist organisations; and Mohamed Abdel-Aziz El-Shennawi, a former deputy head of the Supreme Constitutional Court. The list also includes prominent constitutional law professors such as Salah Fawzi (Mansoura University), Sabri El-Senossi (dean of Cairo University’s Faculty of Law), Hesham Okasha (deputy head of Beni Suef University’s Faculty of Law), Amal Othman (a former minister of Social Affairs and a professor at Cairo’s Faculty of Law), Hesham El-Badri ( a professor of public law), and Mohamed Eid Mahgoub (deputy minister of justice). The list does notably exclude Amr Moussa, Egypt’s former foreign minister and the man who chaired the 50-member constituent assembly which drafted Egypt’s current constitution in 2014. The dialogue is being held after 485 MPs provisionally approved the proposed amendments in a plenary session on 14 February. 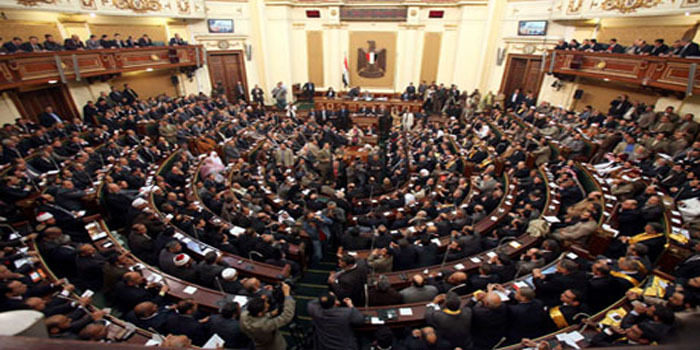 The amendments, submitted by the parliamentary majority Support Egypt coalition on 11 February, involve changes to 11 articles of Egypt’s 2014 constitution: articles 102, 140, 160, 189, 190, 193, 200, 204, 234, 243 and 244. The coalition also proposed that eight new articles be added to the constitution. According to speaker Ali Abdel-Aal, the amendments have six objectives: to give a greater quota of parliamentary seats (25 percent) to women; create a second house (the Senate); increase the presidential term from four to six years; reinstate the post of the vice president; regulate the system for selecting the heads of judicial authorities; and re-define the role of the army in defending the country.